Kali Hyham ’21 is a force to be reckoned with on the Bison women’s water polo team. As one of the sole utility players on the team, Hyham’s skill-set allows her to be versatile, filling many different roles. In a three-game weekend at Harvard on April 6-7, Hyham contributed with goals on the scoreboard and was a key player, drawing ejections and steals. Hyham’s strong performances allowed the Bison to go undefeated for the weekend, notching an 11-7 win against George Washington, a 9-7 victory over No. 14 Harvard, and an 8-4 defeat of Brown. Hyham credits her passion and inspiration to play water polo to her coaches throughout the years. 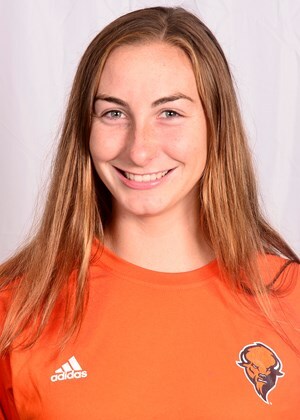 A 2018 All CWPA-Championship Second team selection, Hyham has accumulated a plethora of experience to help her in the pool, learning strategies along the way to assist her teammates in improving their performance. As an outspoken leader on the team, Hyham tries to promote positivity and hard work as a team mentality. “I try to be as positive as possible at practice, especially during hard workouts. I love to get better with my team, and the workouts are all part of that,” Hyham said. Competing in a Division I program comes with many ups and downs. According to Hyham, positivity is key for the women’s water polo team, as they have faced several challenges throughout this season. “We have faced challenges with some injuries on the team, and we have had to learn how to adapt and work as a team through that. We are hoping that everyone will be healthy and ready to play for the rest of the season,” Hyham said. Reflecting on the past and looking forward to championship play, Hyham recalls her favorite memory of hosting the CWPA tournament in Kinney Natatorium. “My favorite memory of my career so far is when the CWPA tournament was home and we were able to play and win big games in front of our friends and family. The energy was great and it was so much fun being at home for that,” Hyham said. The women’s water polo team will be finishing up regular season league play on April 13-14 and then will continue onto their last few tournaments. “I am looking forward to finishing out our league games at home this weekend. I am also excited for our final tournament in a couple of weeks because the team has worked hard all season and we will finally be able to compete at the highest level,” Hyham said.